Take the quality of care, patient safety and healthcare worker productivity to the next level in your institution with Motorola’s healthcare mobile computing portfolio. With our easy-to-use and easy-to-carry devices, your healthcare workers can access patient information, perform a triple check to verify the right medication is about to be administered to the right patient, monitor patient vital signs, place pharmacy and lab orders, access test results and more — all in just seconds, anywhere inside your healthcare facility. Add government-grade security for HIPAA compliance, a rugged design to endure daily use inside the hospital, a disinfectant-ready housing designed to withstand regular exposure to the harsh cleaning agents required to prevent the spread of bacteria, powerful tools for centralized management of all your mobile devices — including attached device accessories — and you have maximum value in a minimum footprint, all at the right price. With our healthcare mobile computers in hand, your staff can electronically capture and transmit virtually any type of data from patient bedside right to your business systems. Our revolutionary scan engine delivers unparalleled performance on every 1D and 2D bar code and is optimized for the read ranges and bar code densities common in healthcare — including those on small vials and test tubes. Omnidirectional scanning provides true point and shoot scanning simplicity — no need to align the bar code in the field of view. First-time, every time scanning of even damaged and poor quality bar codes enhances user confidence and data capture speed. In addition, the integrated 3.2 megapixel autofocus color flash-enabled camera combines with the latest in display technology to enable the easy capture and viewing of high-resolution photographs, video footage and documents — complete with legible fine print. With our healthcare mobile computers, your clinical staff can count on consistent best-in-class mobile application performance, regardless of whether your applications incorporate high resolution video, documents and images or large databases that must be resident on the device. This family offers a robust processing platform, from operating system to memory architecture, including Microsoft Windows Mobile 6.5; a MarvellTM PXA320 processor with 806 MHz of blazing speed; and 256MB RAM/1GB Flash with a user accessible microSD slot to accommodate up to 32GB of additional storage. And the ability to automatically switch between portrait and landscape display modes with a flick of the wrist provides additional real-estate and easier viewing for more complex applications. Our healthcare devices are built to last — and our toughness tests prove it. 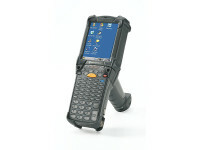 Motorola MAX Rugged, Motorola’s set of signature rugged specifications — including MIL-STD 810G — ensures outstanding performance. Even after exposure to heat, cold, dust, drops, spills, wipedowns, constant disinfecting and 1,000 consecutive tumbles in our rotating tumble drum, the devices continue to operate reliably. The result is a dramatic reduction in repair requirements and downtime and a strong return on asset (ROA). In addition, the ability to frequently disinfect our mobile computers throughout the day helps prevent the spread of bacteria among patients and caregivers. The special housing can be safely sanitized with many common cleaning agents, without damaging the plastics or the sensitive electronic components. Inside the hospital, different types of workers use different types of devices. Administrators may carry Motorola’s TEAM VoWLAN phones. 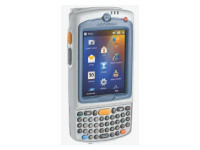 Physicians may carry Motorola’s small pocketable mobile computers, the ES400. Nurses and lab technicians may carry our healthcare mobile computers for point-of-care applications as well as mobile voice. Biomedical engineers and materials management personnel may carry the MC75A or MC55A0. And campus security as well as custodial and patient transport staff may carry two-way radios. Typically, these devices cannot ‘speak’ to each other, resulting in ‘islands of voice’. But Motorola’s Integrated Voice Solutions provide instant push-to-talk communications between these devices. And in the critical care setting of a hospital, the powerful and highly cost-effective one-to-one and one-to-many voice communications across workgroups ensures the lightning fast response times that save lives and improve the patient experience. Enterprise-class accelerometer technology injects our mobile computers with the intelligence to save power whenever a device is not in use. For example, devices can automatically revert to sleep mode if movement is not detected in the period of time you specify, or if the display is placed face down on a surface. In addition, Motorola-unique wireless LAN (WLAN) features also reduce processing requirements by filtering out unnecessary system traffic, conserving power for application access. Simplify life for your clinical staff and your IT department with comprehensive wireless connectivity inside the facility. Support for 802.11a/b/g enables easy integration with virtually any wireless LAN — as well as the flexibility to segment voice traffic to ensure quality of service for VoWLAN communications. With the latest Bluetooth technology, clinical staff can connect wirelessly to a wide range of Bluetooth-enabled peripherals — from headsets and printers to medical equipment. Motorola MAX Secure keeps your data safe with the most advanced set of security features available in this product class. Native FIPS 140-2 Level 1 certification and support for the most advanced encryption and authentication algorithms as well as Virtual Private Networks (VPNs) provide the compliance required for government-level applications, easily meeting HIPAA regulations. And Motorola’s deep knowledge of wireless infrastructure enables the integration of FIPS and other security requirements without negatively impacting WLAN performance. In addition to offering the right set of features for your users and applications, our healthcare mobile computers also reduce IT time and cost by enabling rapid and cost-efficient application migration and development. 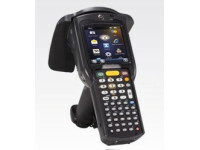 The Motorola standard platform enables easy integration into your existing technology environment. 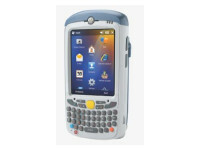 Since all Motorola mobile computers share this common platform, existing applications developed for other Motorola mobile computers can be ported to our healthcare product line with minimal effort. If you are deploying new applications, our robust award winning partner channel offers well-tested best-in-class healthcare applications. And another Motorola tool, PocketBrowser, makes it easy for your own resources to develop applications in-house. 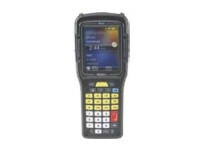 This tool provides a familiar and easy-to-use environment that enables the easy incorporation of the wide range of advanced data capture capabilities available in our devices — from bar code scanning to document and signature capture. A Motorola-unique toolset provides unparalleled management of your mobile devices. Motorola Mobility Services Platform (MSP) allows your IT department to remotely stage, provision, monitor and troubleshoot tens of thousands of devices in locations all around the world, all from a central location. The result is a radical reduction of one of the largest costs associated with mobility — day-to-day management. Device-level intrusion protection solutions allow the addition of extra layers of security to protect data that is resident on the device and in transit to and from a wide variety of mobile products and your network. And AppCenter allows you to easily define which device features and software applications users can access, preventing unauthorized device usage that could reduce productivity. No matter what services you need, we have you covered. If you are implementing your first mobility solution, we can provide assistance at every stage — from planning through design and deployment. If you are adding new healthcare applications, we can help you identify whether your present wireless LAN can handle the increased load — as well as any other gaps that need to be addressed to ensure smooth deployment. And since even the most rugged devices require a support plan, our Service from the Start with Comprehensive Coverage will keep your devices up and running at peak performance, providing the peace of mind you need in your critical care environment. This unique all-inclusive service covering normal wear and tear as well as internal and external components damaged through accidental breakage, all at no additional charge, significantly reduces your unforeseen repair expenses. And options such as Commissioning Service and Express Shipping further minimize downtime in the unlikely event a repair is required.